Sometimes, I don’t read alone. I’ll find myself accompanied by those opinionated shoulder-dwellers, angelic and diabolical, vigorously arguing the merits of whatever I happen to have in my hands at the time. “And you pretend to care about issues of equality and social justice,” Shoulder Angel will tut at me. “What does liking this book say about you that you like this?“ “Dude, lighten up. It’s awesome,” Shoulder Devil will retort. In my defense, I often side with Shoulder Angel. I feel like I owe him after shutting him down during the whole Hot Gimmick thing. And I vividly remember Shoulder Angel and me staring at Shoulder Devil, waiting for him to launch some defense of Gakuen Prince, but he just shrugged: “I got nothing. That’s just nasty.” Even Shoulder Devil knows when to keep mum. 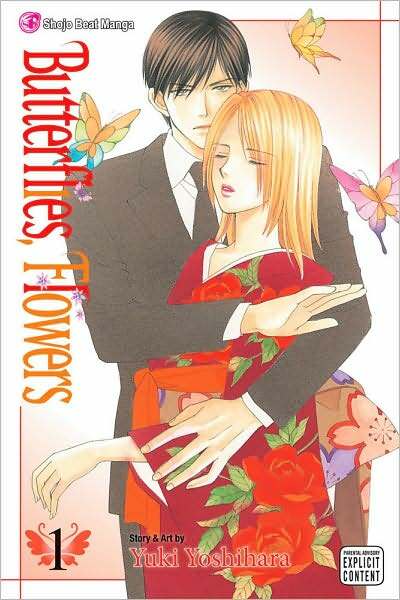 The three-way discourse didn’t get particularly heated as we were considering Yuki Yoshihara’s Butterflies, Flowers (Viz), but it did get somewhat spirited. I mean, there’s some desperately inappropriate workplace behavior, and the relationship dynamic between the two protagonists is an absolute minefield, but it’s really pretty funny. Even Shoulder Angel chuckled a little bit. It’s about a former rich girl who must enter the office grind after her family loses their fortune. The economy being what it is, she can’t be picky about which job she takes, even if she is asked if she’s a virgin during her job interview. (Tip: if that happens to you in real life, document the exchange, then sue.) The inappropriate interviewer ends up being her direct supervisor and, coincidentally, the son of one her family’s domestics. He doted on her when she was a kid, but now he’s the boss from hell. Domoto, the ex-servant, now-boss, whiplashes between domineering and capricious and subservient and solicitous, and office newbie Kuze doesn’t know what to make of it. (Who would?) Her sudden promotion has alienated her from her co-workers, and while she’s mostly hopeless as an office lady, there’s enough of the aristocrat left in her that she can muster unexpected authority in a pinch. Her work life is complicated by the fact that, against all good sense, she’s afraid she actually might be in love with her bipolar boss. Okay, so the overall premise is kind of gross, what with the power disparity and the hostile work environment. But moment by moment, Butterflies, Flowers is very, very funny. The supporting characters are particularly delightful. I love Kuze’s younger brother, who never got over his brief taste of the good life and talks like he’s a refugee from a costume drama. Suou, a senior member of Domoto’s department, is one of those deliciously snarky frienemies that improve just about any story. Their absurdity heightens the atmosphere and helps the reader ignore the stuff that’s creepy when stripped of Yoshihara’s context. So it’s a guilty pleasure, but it’s undeniably pleasurable. Viz is positioning it as a bridge title for shôjo readers into the more mature realm of josei, and its rapid-fire humor, stylish look and twisted romance make it a good choice for that. It’s not the most sophisticated josei in the world, but it’s a sensible starting point for a tricky demographic, and it’s funny much more often than it’s squirmy. This entry was posted on Thursday, December 10th, 2009 at 7:11 am and is filed under From the stack, Viz. You can follow any responses to this entry through the RSS 2.0 feed. Both comments and pings are currently closed. Sounds like Domoto is the embodiment of Machiavelli’s The Prince in the office place. Act randomly to keep your subordinates constantly off guard. Now you’ve got me wanting to see a high-school shojo manga based on The Prince. I’m sure there are several that draw on it for inspiration, knowingly or otherwise. Actually, that sounds like a great idea. I’d like to see that shojo too. They could call it The Princess. A lot of people seem to have hated it. I suspect that’s because there’s too many people who read manga as if they’re set in the United States, and expect American sexual norms. Here’s a hint: Japan is a sexist, socially dystopic disaster. There are *reasons* they’re in the running for lowest birth rate on the planet, and their towns are full of unmarriageable otaku, hikkikomori and schools closing for lack of children to teach. Why folks insist on love-comedies with love-interests and protagonists who are paragons of healthy socialization is beyond me, anyways. Fiction exists to externalize entertainingly bad behavior; personally, I hate hearing about the dysfunctional behavior of real people. Misery is so much better when it’s been inflicted on fictional people. Oh, Butterflies, Flowers? Eh, it’s OK. Not enough female characters – and no, Suou doesn’t count. The writer jumped into the premise too deep, too fast. I feel like the other employees are too much of a judgemental smear, rather than distinct individuals with any sort of personality. Not enough characters, period, for that matter. Too much time spent in the protagonist’s family’s restaurant. I hope it gets better. Actually, judging from some of the nonfiction I’ve been reading, the stuff Choko goes through doesn’t look too far-fetched. Domoto’s reaction to the drunken-client assault scene seems to have drawn a lot of ire, but it is true that Japanese women are expected to humor sexually aggressive men, and dissuade them gently without causing a fuss, especially in a corporate environment. And it wasn’t too long ago that being a virgin (or at least single and of good reputation) was a entirely standard requirement for a secretarial job.